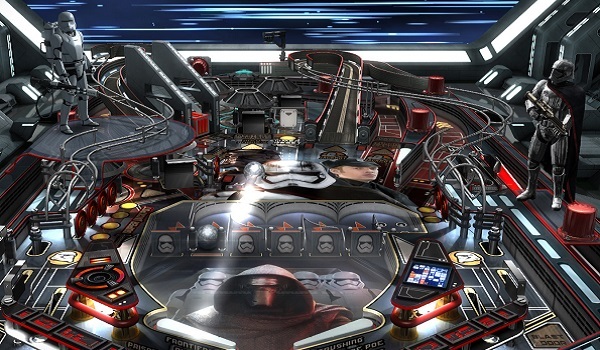 Zen Studios have added another pair of tables to their Star Wars Pinball and Zen Pinball 2 lineup, taking players on a trek through the latest movie in the (once again beloved) sci-fi movie franchise, Star Wars: The Force Awakens. And as is pretty much standard for Zen these days, both tables are excellent. If there's one thing Zen Studios does well, it's capture the feel of a specific property in the not-so-standard form of a pinball table. Working alongside Lucasfilm and Disney for this latest batch of tables, the authenticity goes beyond having the licensed visuals and sounds of the Star Wars universe. Both The Force Awakens and Might of the First Order are built to play like their namesakes, with the former being a bright, fast and exciting romp through the world of the latest Star Wars film and the latter being a darker, slower, more precise table. When Zen Studios first hit the virtual pinball scene last generation, they began with a small collection of original tables that would feel at home in any arcade (You know, if those still existed). Over the years, the team and its games have become synonymous with licensed pinball tables, producing everything from a boatload of Marvel and Star Wars pinball tables, to tables based on properties like South Park, Archer, Portal, Street Fighter and even Telltale's The Walking Dead. Those tables are almost uniformly excellent, and that pedigree holds true with the newest tables set in a galaxy far, far away. The Force Awakens is easily my favorite table in the package. I should probably start off by saying you should see the movie before playing the table, because it actually does a pretty good job of taking the player through the plot of the film, hitting on some major moments. The table initially sets you up on the desert planet of Jakku, just like where the film begins. From there you'll visit the Jedi temple, the Starkiller base and more. The world around the table actually shifts in order to show where the mission takes place, once you've triggered it. A tightly packed table, you can expect lots of looping ramps, a magnetic target at the middle of the table that serves multiple functions, a side table boasting an appearance from BB-8 and more. There's even a few alien tentacle monsters that can pop up from time to time, as well as Stormtrooper drop targets that will assault your flippers. Throw in the occasional appearance of folks like Rey, Finn, Poe and a couple of baddies, not to mention some aerial chases taking place above the table, and you've got a frantic and fun table boasting some tricky shots and plenty of fun toys. Might of the First Order, on the other hand, takes place on a Stardestroyer ship and boasts a nice view out the front window, a holographic view of the ship itself, as well as a trooper with a real love of fire and my beloved Captain Phasma. Unfortunately, Phasma's role is similar to the one she plays in the first film of the new trilogy, which means she barely does anything. The table itself is wide open on the lower field, giving the player clear shots at the ramps and alleys nestled at the back. It's easier to hit your shots on Might of the First Order, and the ramps are slow enough to allow you a bit of thought before racing on to the next shot. Along with all of the standard missions that will pop up throughout play, there's a lower play field nestled in the main field that offers a couple challenges of its own as you try to rack up a new high score. Earning a special mention on both of these tables is the voice work. I don't need pinball voices to be identical to the thing that they are based on, but there have been a few instances in Zen's previous licensed tables where the voice actor had clearly never seen the show/movie they were working off of, and boy did it show. While there aren't any chameleons here, everyone sounds close enough to the source character to pull the whole thing together. So yes, in short, Zen has done it once again. Neither of these tables has much new to offer in the grand scheme of things, but at least they're both packed full of missions and toys that work well together and fit the themes well. It's also nice that, sold as a two-pack, these tables offer completely different experiences that should please any fan of pinball, virtual or otherwise.